Speaker of Parliament, Dr. Jiko Luveni, made a ruling on a point of order that was raised by National Federation Party, Leader Professor Biman Prasad, earlier today. 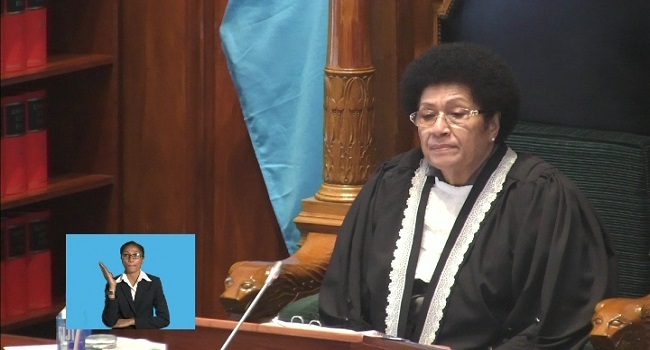 At the end of today’s Parliament session, Dr. Luveni reminded all MPs that points of order applies only to the rules and prentices of the house. She says it’s not done on the content of any speech or comment but can be raised during any time of a parliament sitting. Professor Prasad was instructed by Dr. Luveni to stop mid-way from raising his point of order regarding the adoption of the Standing Orders which was presented yesterday. The NPF Leader then walked out of parliament and later clarified his point of order in a written letter to the Speaker of the House.